Kolkata is one of the loudest and most chaotic cities I've ever visited, but that also makes it one of the most exciting! After visiting Mother Teresa's Home, Victoria Memorial, and a number of other famous places in Kolkata, I was ready to go on a longer excursion. Located north of the city are two famous temples, and one day during my visit, I decided to go to both of them in a little day trip. The first stop was Belur Math, a temple that's dedicated to Ramakrishna Math and Mission, a branch of Hinduism. 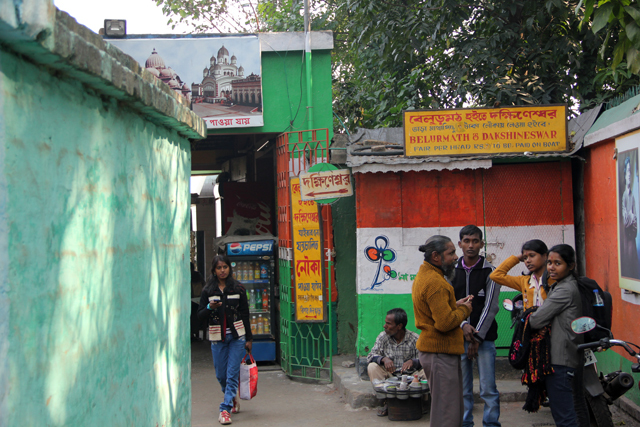 To get there we took a taxi from the Howrah station to the gate of the temple. Unlike visiting a few other Kolkata attractions, Belur Math was quiet and peaceful. After entering the gates no touts were hanging around and there was no one trying to sell me anything – it was a nice relief. Unfortunately, they were very strict with their no photos policy, and if anyone tried to snap a photo a guard would immediately run up and enforce the rule. So the only photo I managed to capture was this glimpse from the river. The architecture of Belur Math is mostly Hindu and Buddhist in design, but they also used both Islam (Mughal) and Christian ideas and decorations in the construction. There's a place to remove your shoes and safely store them as you walk around the interior. 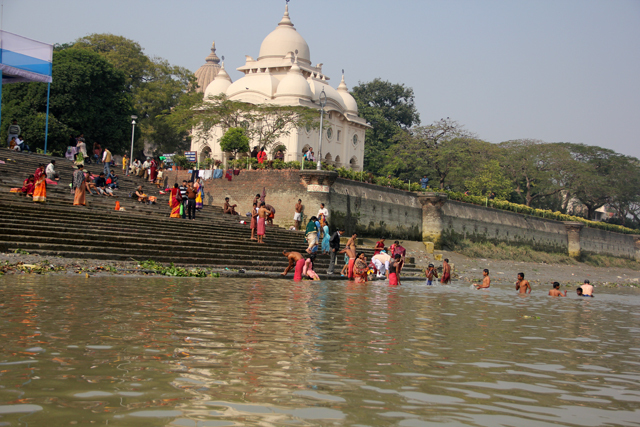 After walking around Belur Math for about an hour I proceeded to the banks of the Hooghly River to catch a boat to Dakshineswar Kali Temple. You can either take a private boat (where you'll have to pay the entire fee), or you can wait until enough people have gathered to take a shared boat. I waited for about 15 minutes until there were enough of us to share a boat. 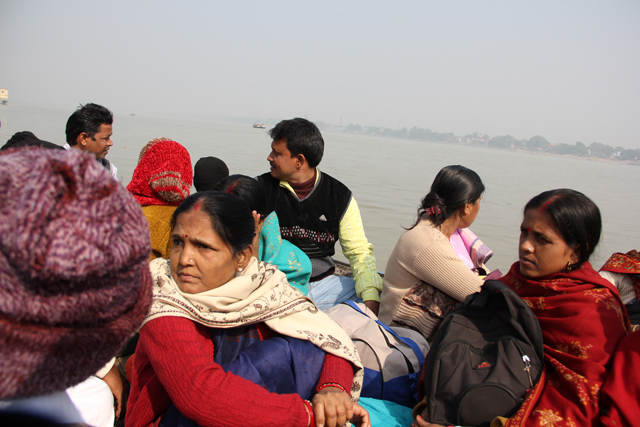 After we were jam-packed onto a tiny boat, the ride took about 20 minutes and cost just 10 Rupees per person. On the boat ride it was nice to see the life on each side of the river while the small engine of the boat slowly battled its way upstream. 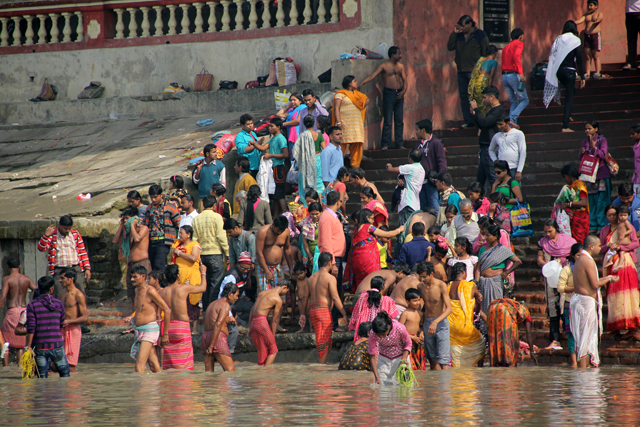 The Hooghly River is a distributary (meaning it's an off-shoot) of the sacred Ganges River, so Hindus consider the Hooghly to be holy water as well. 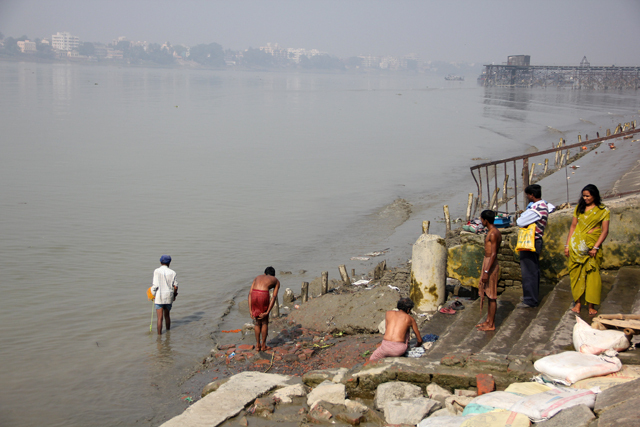 Along the banks of the water were many people bathing, washing their clothes, and splashing in the river. We finally arrived to Dakshineswar, a temple that's much larger than Belur Math. Since I went on a weekend, there were many people at the temple, most of them waiting in line to enter the main part of the temple and pay respect to the Kali Goddess. 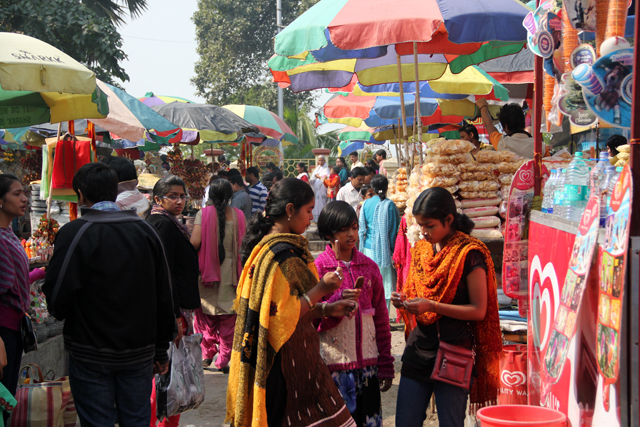 Surrounding the temple, were many Hindu religious items to purchase as well as plenty of snacks and beverages to consume. The line to get into the temple literally stretched for kilometers as Hindus waited their turn to enter the temple. Not having the time to wait for hours to get in, I mostly explored the surrounding area, observed the river, and walked around for different views of the temple. 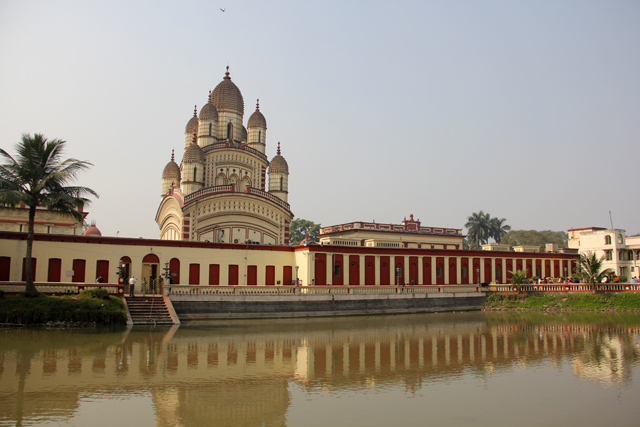 The Dakshineswar Kali Temple almost didn't look real, it looked like a painting! After a few hours of exploration, I jumped in a yellow Kolkata taxi and headed back to the central part of the city. It was another wild ride through the narrow and always teeming streets of Kolkata, a city where everything you do is an adventure! Great pics! This is definitely on my Bucket List!! Sad I missed it when I was in India last. Amazing information here. I have a trip to the area coming up soon and I hope to try a couple of these out! Thanks for a great blog. Very useful information. I also plan to go Kolkata.